The baby is not here yet, so we’re still visiting lots of places in the area. And the weather has given us a break, so this week has been pretty frantic at Cairns Unlimited. 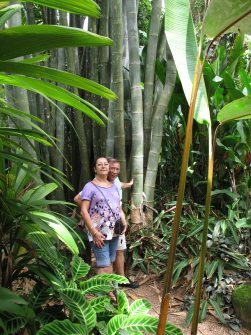 Last Sunday I took my parents to the Cairns Botanic Gardens, where we saw lots of different species of plants from all over the world. 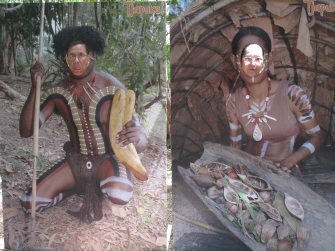 Of course, only from those nations with a climate similar to the tropical weather you can find in Cairns, otherwise, it would be impossible for them to survive. My mum is very surprised to find in Australia plants and flowers she has seen in Spain. I guess she thought that when she was coming to Australia she was leaving Planet Earth and arriving to a completely different planet. 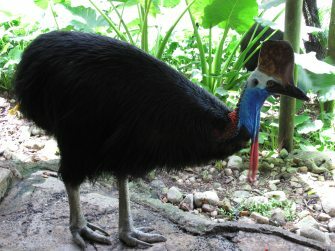 After the Botanic Gardens we went to visit the Centenary Lakes, one of my favourite places in Cairns. The Centenary Lakes is the name given to the park where one freshwater lake and one saltwater lake coexist. 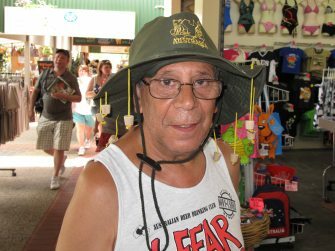 It’s a beautiful place, with lots of different plants, trees and where lots of people go for the typical Aussie barbecue. 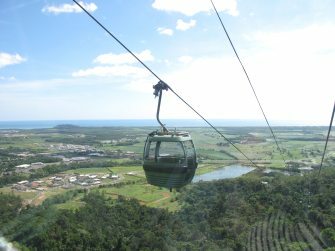 And yesterday it was time to visit Kuranda. 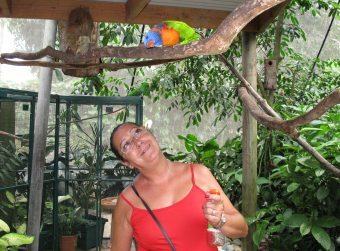 We had a full day planned: first, from Cairns to Kuranda on Skyrail, , then a visit to the Koala Gardens, and Bird World, and back to Cairns onboard the Kuranda Scenic Railway, . Skyrail has been built taking into consideration the environment and they are very proud, so they should be, of not having destroyed any part of the rainforest while building it. All the posts were situated where there were clearings, so no trees were cut down at all. Of course, to be able to take the posts to where they were going to be located, workers would have to take them through a very dense rainforest. However, they used helicopters to transport the posts. And the workers had to work one hour each day to their work place and one hour back. A whole lot of work, isn’t it? But it’s definetely worth it. When you go on Skyrail, make sure you stop in the two stations along the way. 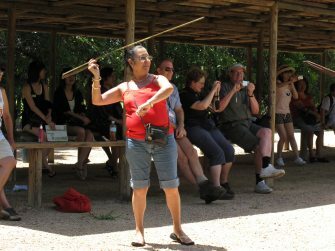 And if you are lucky enough to catch one of the rangers and do the guided tour with them, don’t miss it. They will tell you a lot about the plants in that section of the rainforest. You will then learn why a plant is called “Wait a while”, for example. 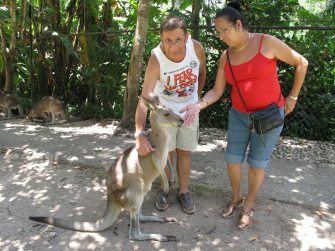 After being dropped off in Kuranda and taking the free bus that connects both the Skyrail Terminal and the Kuranda Scenic Railway station with the town centre, we made our way to Koala Gardens. 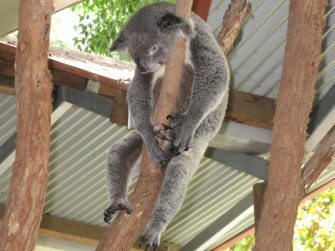 You may not know that not all the states in Australia have the same laws, and while in New South Wales you cannot hold koalas, , that’s something very popular in Queensland. Don’t worry, koalas only “work” 30 minutes so they don’t get stressed. And by the way they spend their whole day sleeping, you can see their levels of stress are pretty low. And then it was time to visit Bird World, almost next door. It’s a small enclosure where there are lots of different species of birds flying around you. If you visit it, you will have to be carefull with your jewellery, because some of the birds are attracted to all shinning things and you could loose your earings or a necklace very easily. So without our jewellery we entered the premises and were welcomed by lots of different birds. They were absolutely fantastic and so used to humans that they’re not scared to come close to you. 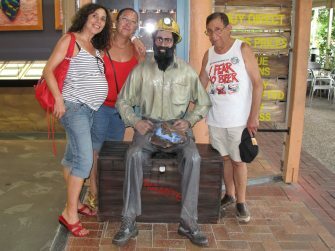 And then it was just time to hang around the markets, do a bit of shopping for friends and family back in Spain and enjoy a cold drink just before we got on the Kuranda Scenic Railway to come back to Cairns. 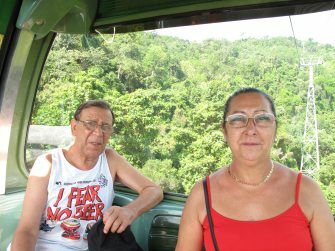 Again, as it happened with the Skyrail, both my parents were very impressed with the train. 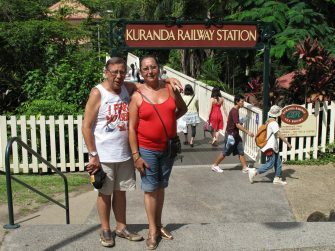 It took us about 90 minutes to descend from Kuranda to Cairns, all the time through amazing scenery, waterfalls, rainforest, etc. While you are on the train, you will be able to hear the story of the first pioneers of the area, those who built the rail line and their sufferings. I don’t think we ever give a second thought about things such as whoever built the first railway lines in very inhospitable and remote areas. 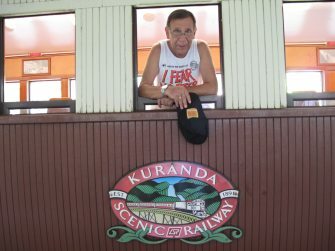 Kuranda Scenic Railway hasn’t forgotten its origins and the whole presentation you can see while on the train is really worth while and eye opening. Of course, don’t forget to still keep an eye on the scenery.